Luxury. It’s something that we all aspire to. When something is not essential to survival and it truly contributes to your wellbeing, it’s luxurious. It’s the little touches of luxury in the home and garden that define your style and make your space unique to you. 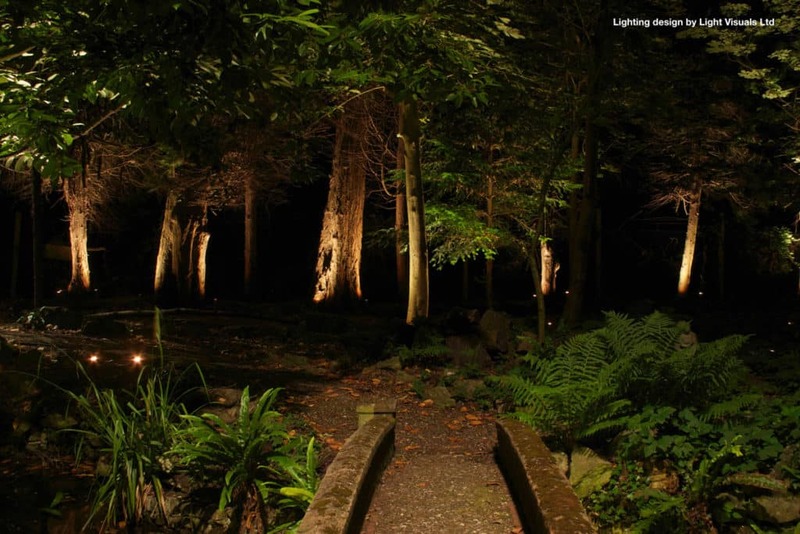 I consider garden lighting to be absolutely essential in a garden and it’s well worth every penny. How effective is this lighting? Designed and installed by my friends at Light Visuals Ltd, it’s as though nothing exists other than this gazebo and the path leading to it. Imagine how this lighting could make you feel secluded and secure. Would the ambience be the same if the lighting were different? This is the practical side of lighting. There’s no doubt that lighting can help keep you and your property safe. Whether it’s by alerting you that somebody or something is nearby or whether it’s illuminating steps or paths so that you don’t trip. It’s absolutely invaluable. And there’s no reason why it should be boring. You can use coloured lights, spotlights, strip lights, uplighters or whatever takes your fancy. Garden lighting has come a long way in the past decade. You can even control it with an app on your mobile phone. We’ve touched on the possibilities for illuminating paths and steps in the garden, but what about the driveway? How about water features? or just something simple like lighting up the keypad for the garden gate? I’m writing this in August knowing that it will be light until well into this evening. But three months from now it’s going to be getting dark at 4pm and staying dark until 7am. I’d really rather not be fiddling with my keys trying to get through the gate when it’s pouring with rain and freezing cold. Garden lighting can, and should, be designed for all four seasons. 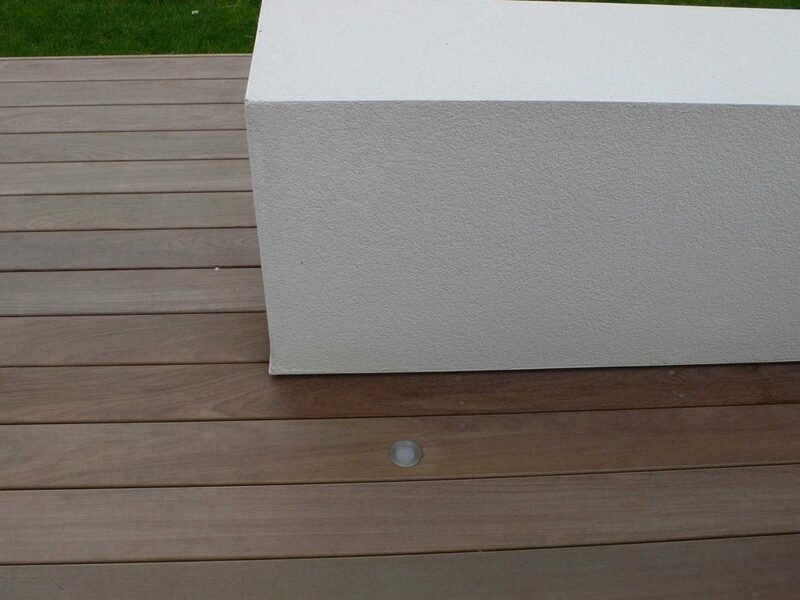 When you design and build a new garden you will most likely include some beautiful features. Things that you are really proud of. 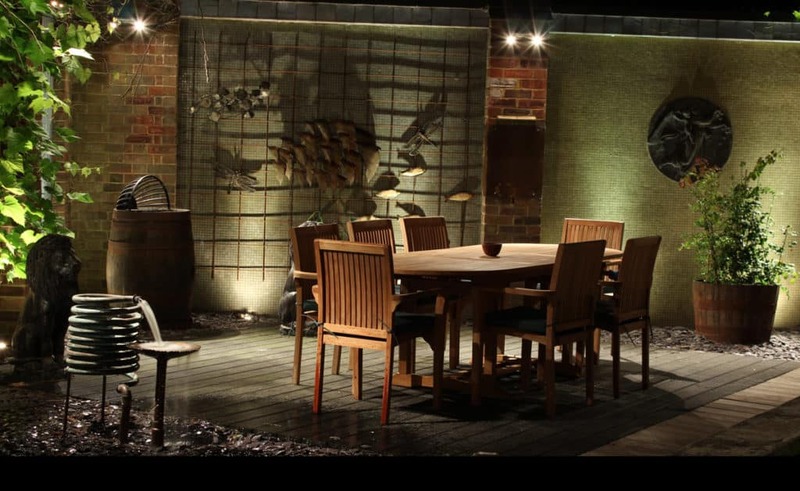 A water feature, a pergola, decking, paving, stunning plants, artwork – even decorative screens can really be bought to life by garden lighting. And you can enjoy them 24/7. In winter for example, when deciduous trees have lost most of their foliage, you could use lighting to accentuate the shape and the intricacy of the bare branches. That way they are still stunningly beautiful. Using coloured lights will add a whole new dimension too. Clever placement of lights and objects make this outdoor dining area into a fascinating space. Look how the light plays on plants, water features and wall art to create shadows and highlight colours. Beautiful! Next time you are on holiday or in town for the evening, try to look at how lighting affects the ambience. Trees and buildings that may otherwise appear threatening, suddenly become welcoming. Careful lighting can turn a dark, uninviting space into somewhere intriguing and worth exploring. It can make an outdoor dining area irresistible and planting fascinating. We all have a dark corner in the garden that could be made into a feature with clever lighting. Even a flat space such as a lawn or a patio where the daytime appeal is in the colour and texture, can be given a different look and feel at night when pools of light appear and entice your eye and your mind to wonder what lies beyond. Don’t forget to use the power of reflection in your lighting plans. You don’t need a lake – or even water to harness reflections. Mirrors work perfectly too – and they have lots of other funtions in garden design too. 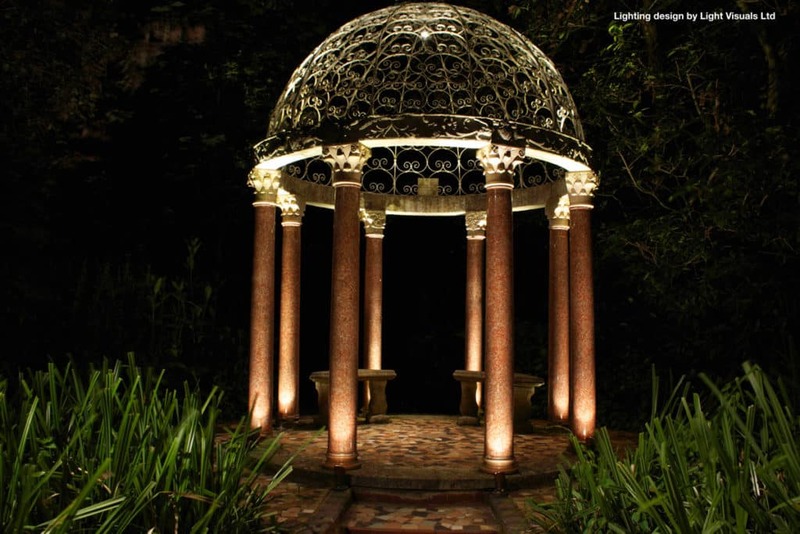 Hopefully by now I’ve encouraged you to think more about including garden lighting in your landscaping plans. If it’s something you’d like to explore, there is a world of choice out there for you. But every form of lighting – apart perhaps from the solar lights that you can place yourself – MUST be professionally installed. Holland landscapes are not electricians but as part of our responsibility for CDM regulations, we will arrange for a qualified electrician to install your lighting system. 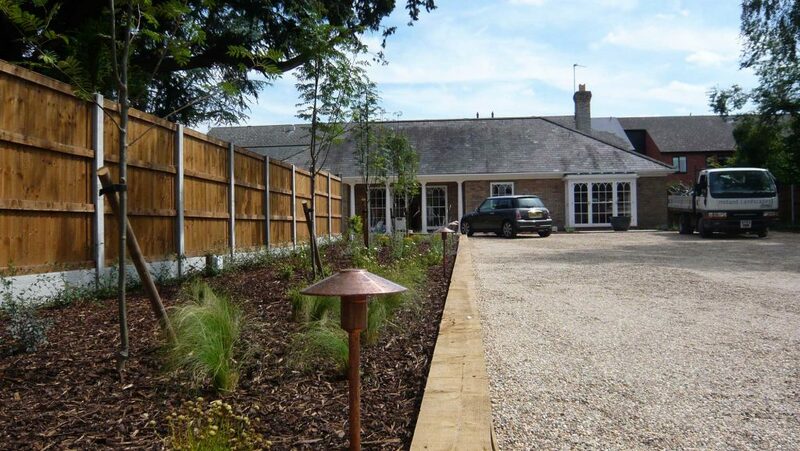 Our subcontractors work with the landscape team to make sure that fixtures and fittings are placed discreetly but not so discreetly as they cannot be maintained. Whilst relaxing in your garden, you won’t see wires, circuit breakers or control boxes, neither will you trip over lights. You, your children and pets will be 100% safe. 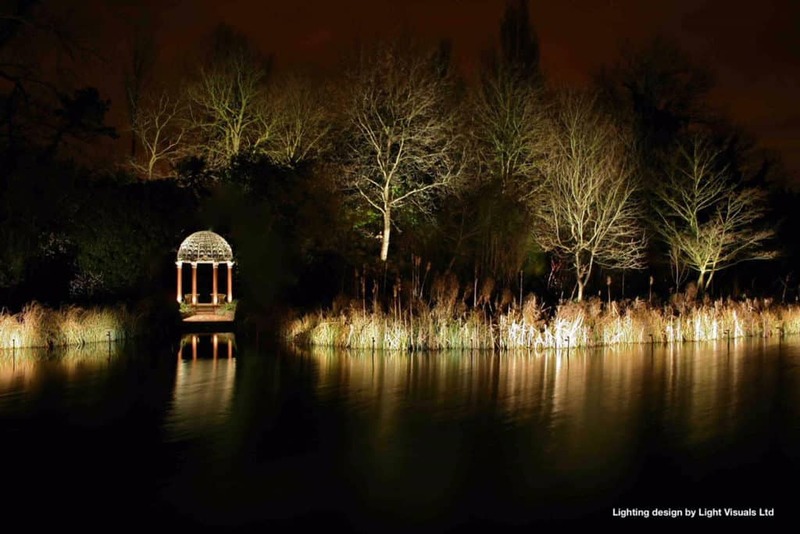 Check out the project galleries from Light Visuals Ltd. You’ll find lots of ideas and examples of garden lighting from lighting up your trees to illuminating your house. There are even ideas for interior design.